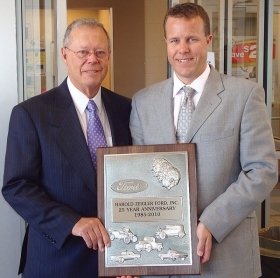 Harold Zeigler, left, and Aaron Zeigler of Harold Zeigler Ford in Plainwell, Mich., received a 25-year award for Ford from Ford Motor Co. Harold is president; Aaron is vice president. 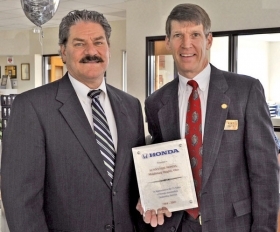 Kirt Frye, right, of Sunnyside Honda in Middleburg Heights, Ohio, receives a 25-year award for Honda from Gary Russo, American Honda Motor Co.'s zone sales manager. 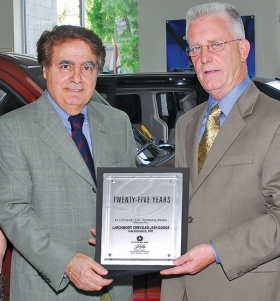 Alfredo Gulla, left, of Larchmont Chrysler-Jeep-Dodge in Larchmont, N.Y., receives a 25-year award for Chrysler from Richard Grady, Chrysler Group district manager. 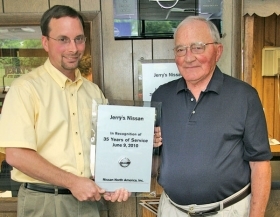 Jake Miglorie, left, and Jerry Miglorie of Jerry's Nissan in Rutland, Vt., received a 35-year award for Nissan from Nissan North America. Jake is president; Jerry is dealer principal. 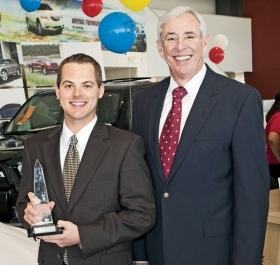 John McGill, left, vice president of McGill Auto Group, receives a 40-year award for Toyota at Don McGill Toyota in Houston from Toby Hynes, president of Gulf States Toyota. McGill is also general manager of Don McGill Toyota of Katy in Katy, Texas. 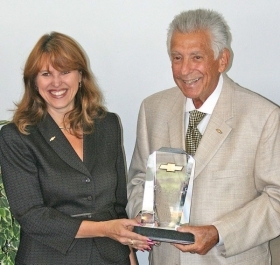 Ron Tonkin of Ron Tonkin Chevrolet in Portland, Ore., receives a 50-year award for Chevrolet from Susan Keenehan, Chevrolet's zone manager. Ron Tonkin Chevrolet is part of the Ron Tonkin Family of Dealerships.